Nature is one of the closest to me, even when I was a kid I love seeing greens, mountains and body of water. It’s always nice to see different colors that you can naturally find around you. Flowers, trees, and everything that is why when I get here in Baguio, one of the places I want to visit again is the Baguio Botanical Garden. This place has a collection of plants that you will truly admire. As one of the green parks in the City of Pines, Baguio Botanical garden is also one of the prime spots that provide peace and quiet to the city. It is located along Leonard Wood right after Teachers Camp and before the Wright Park. It has been known for its different huts of Cordillera and statues that they have used to decorate the parks with real live Igorots that are willing to take photos with you for a small fee. The most latest addition in there was the Centennial Park where the beautiful bronze sculpture of the well-known Filipino artist Ben-Hur Villanueva was depicting the builders of the city, composing of native Cordillera, Americans, Chinese and Japanese who are working together. It is very visible because you will see it as soon as you enter the gate. To get around, you have to pass the stone steps and paths. Tourist and locals will enjoy the towering pine trees, green houses and flower nurseries, including the Art Gallery, pocket garden, fine tree seedlings and a row of souvenir stalls who sells native handicrafts of Cordillera. 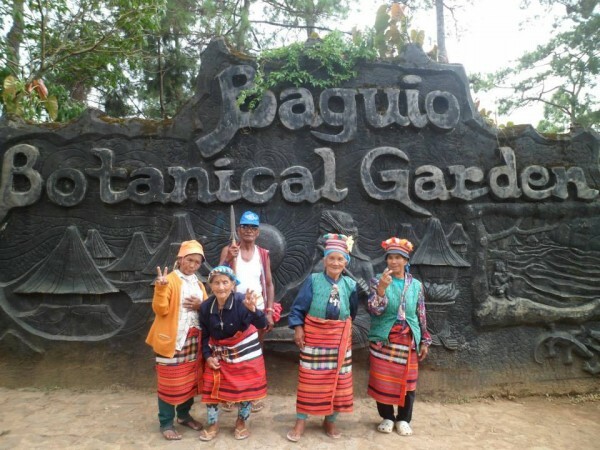 Baguio Botanical Garden is also the favorite location for tribal gatherings and rituals, outdoor concerts and other public activities. It is also pet-friendly, has a good setting for couples, has a public restrooms, and the good thing is that it has no entrance fee and opens daily during daylight hours. However, this place is not a wheelchair friendly and kids are need to supervise closely because there are pools that they may jump into and does not allow of flowers picking.